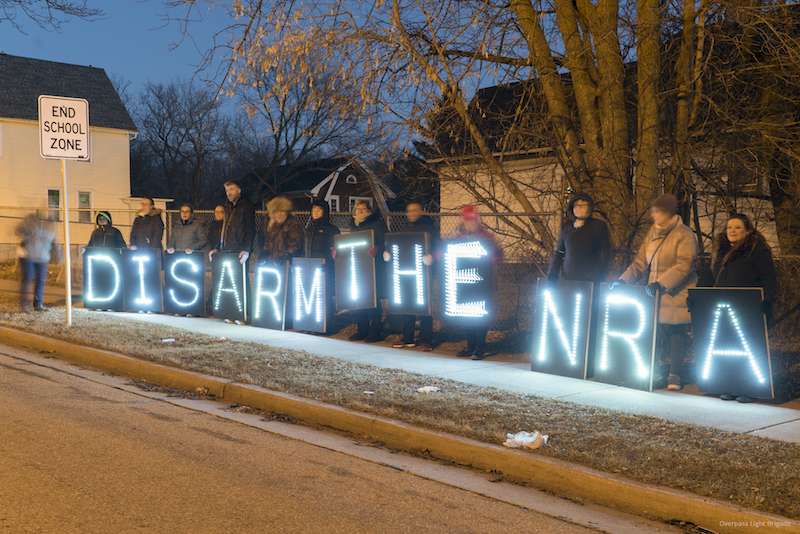 Even with snow predicted, we knew that we would get Holders of the Light to come out last night in order to display a message against the stranglehold regarding access to high-power military-grade weaponry that the NRA has on this country. We don’t need here to outline the absolute lunacy of a society devouring itself, eating its young. We don’t have any magic answers, but understand that it will be a long struggle to reduce violence, fear, and the anger of our unhappy people as we also work towards more sane legislation regarding lethal technologies. So we choose to go out to at least shine some light on the issue, to be a visible part of the push and pull between freedom and responsibility. In that regard, we were pleased to be joined by a number of young volunteers, including a sophomore from Milwaukee’s Obama School of Career and Technical Education, Marvell Reed, who has become a spokesperson among high school students regarding sensible gun legislation. 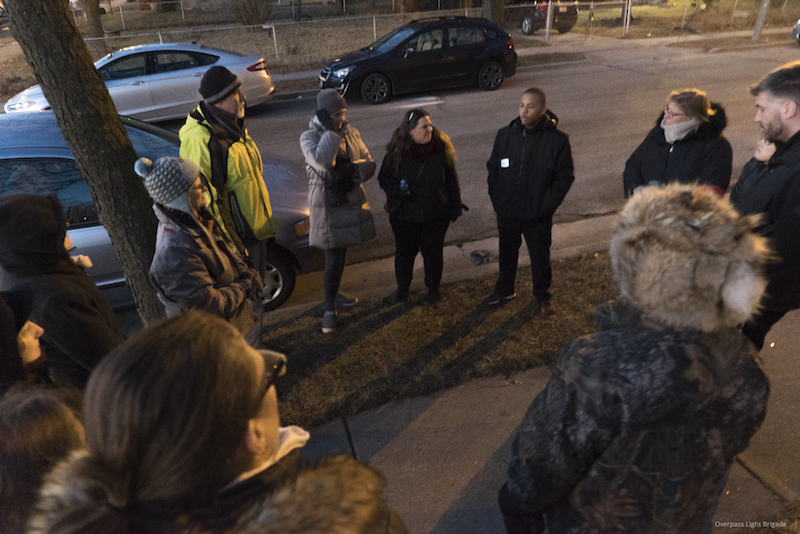 Obama School of Career and Technical Education student and March for Our Lives organizer Marvell Reed speaks to the Holders of the Light (Photo credit: Joe Brusky). The letter panels were passed out to Holders as we had a few quick words about the evening’s action and introduced Marvell to the group. He spoke briefly about the upcoming National School Walkout on March 14, where, at 10:00 a.m, students, teachers and allies will walk out for 17 minutes in memory of the 17 student killed in Florida, and in protest of our leaders’ collective inability to do anything about it beyond their impotent “thoughts and prayers.” He went on to explain the larger national event on March 24, the “March for our Lives,” organized by students from Marjory Stonemason Douglas High School in Florida, with the intention of protestors amassing in cities across the country, as well as a march in D.C. This is big. When do you last remember high school students getting so engaged, so organized, so impressive in their call to responsibility? We need to do all that we can to support them in this growing movement. 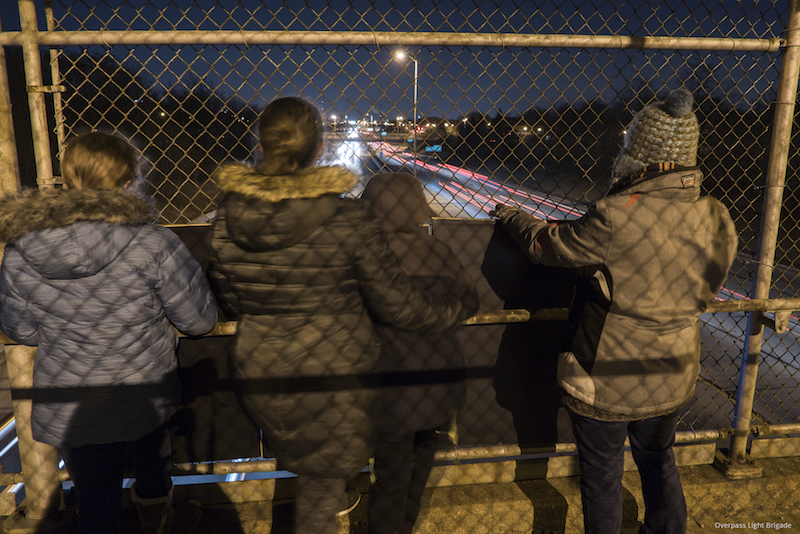 The Holders of the Light arrange their message before heading onto an overpass bridge spanning over I-43 (Photo credit: Joe Brusky). 4) Vote! these jerks out of office! Holding our message over traffic leaving downtown Milwaukee on I-43 (Photo credit: Joe Brusky). We took to the bridge a little after 6:00. It was cold out, a brisk wind blowing off the lake, but it never did snow. A filmmaker friend joined us on his motorized skateboard which he used for DIY trolley shots, and he put together a video from time lapse footage he took via a bridge a half mile down the highway. It was fun being a part of this, and feeling that we are a tiny voice in a grand discussion about basic elements of life itself. Bearing witness with these light panels is something we can do here in Milwaukee, and across the country through the Light Brigade Network. Our filmmaker friend brought his tools and skills to offer something that he can do to help. Every volunteer offered up their time and comfort and solidarity as a gift to the greater good. Marvell demonstrated with great poise and clarity what young people can do and are doing. His classmates are organizing, talking with other high school students and college students, connecting with other issues and advocacy groups. This is something that they can do, and is exciting to see! What can you do? How can you help? 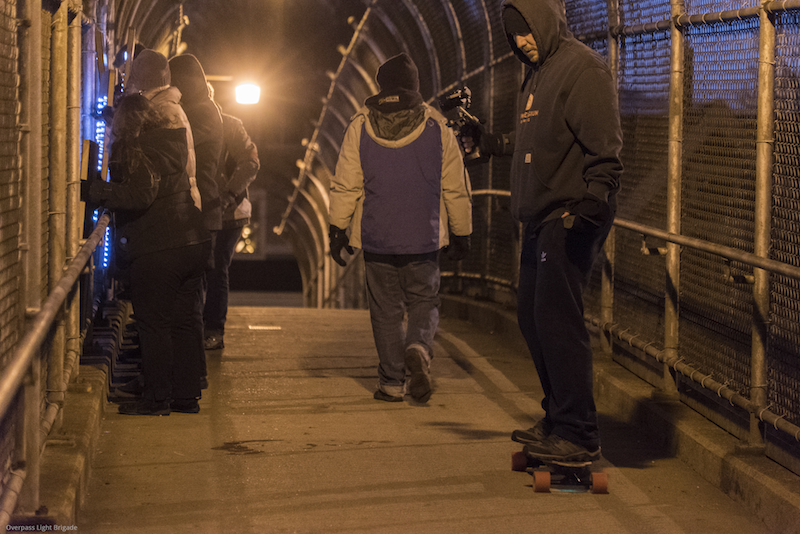 Filmmaker Dusan Harminc filmed the bridge action while rolling over the overpass on his skateboard (Photo credit: Joe Brusky). 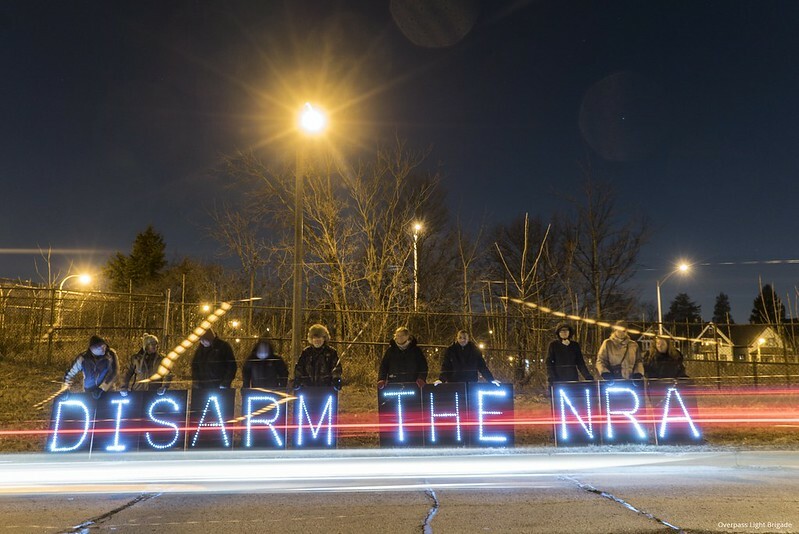 Our Thursday night message for the NRA in Milwaukee (Photo credit: Joe Brusky). The kids are alright, even if they don’t wear dorky winter hats. 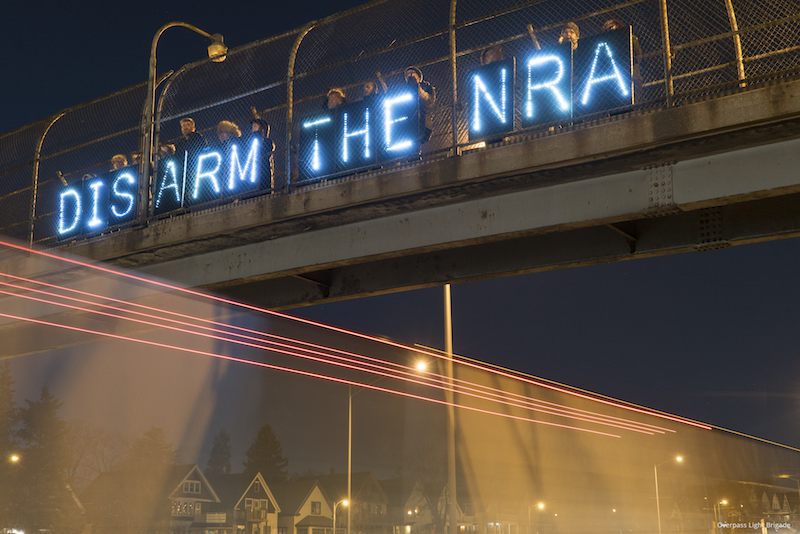 Disarm The NRA from Overpass Light Brigade on Vimeo.